2 grams equals 1 vanilla bean so it takes very little to add to your recipes. Since you can see the vanilla bean seeds, it adds a gourmet appearance, in addition to delicious flavor. Add this paste to homemade ice creams, custards, creme brulee, cakes, icings, etc. For applications where liquid is an issue – Ground Heilala Vanilla bean powder could be the perfect fit! This is vanilla in its most true and natural state as Heilala Vanilla Beans are dried and ground into a fine powder. 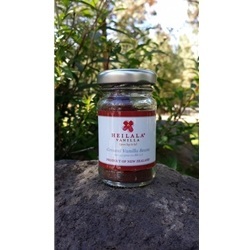 Two grams of ground Heilala Vanilla powder is the equivalent to one Heilala Vanilla Bean.